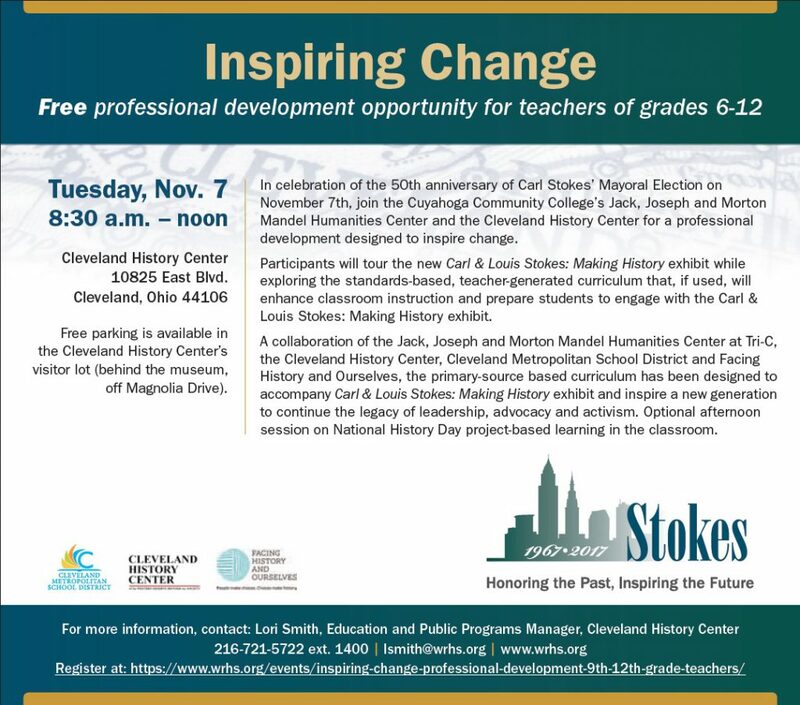 In celebration of the 50th anniversary of Carl Stokes’ Mayoral Election on November 7th, join the Cuyahoga Community College’s Jack, Joseph and Morton Mandel Humanities Center and the Cleveland History Center for a professional development designed to inspire change. Participants will tour the new Carl & Louis Stokes: Making History exhibit while exploring the standards-based, teacher-generated curriculum that, if used, will enhance classroom instruction and prepare students to engage with the Carl & Louis Stokes: Making History exhibit. A collaboration of the Jack, Joseph and Morton Mandel Humanities Center at Tri-C, the Cleveland History Center, Cleveland Metropolitan School District and Facing History and Ourselves, the primary-source based curriculum has been designed to accompany Carl & Louis Stokes: Making History exhibit and inspire a new generation to continue the legacy of leadership, advocacy and activism. Optional afternoon session on National History Day project-based learning in the classroom.